LHA Celebrates Williamstown Micro Cottages with Ribbon Cutting Ceremony | WMB-ROI, Inc. It is always a pleasure to participate in the excitement of a ribbon cutting ceremony. 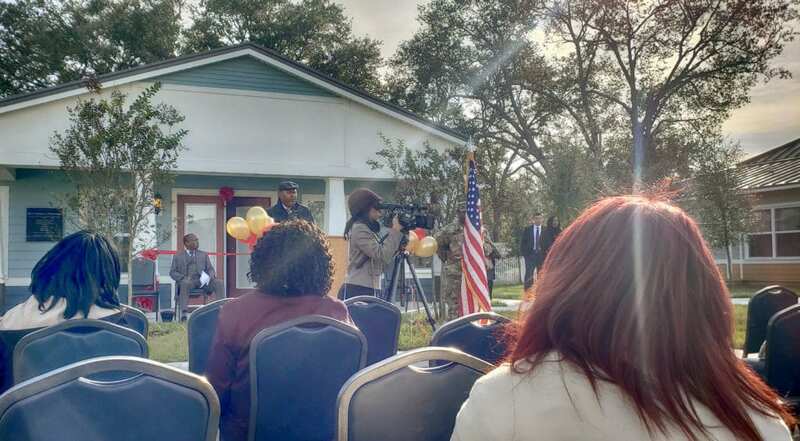 After months of anticipation, the Lakeland Housing Authority held their ceremony for the Williamstown Micro Cottages this morning, and WMB-ROI couldn’t be prouder. The Ceremony opened up with a prayer from Pastor Charles E. Williams, followed by a trumpet rendition of the National Anthem played by Rochelle School of the Arts Middle Schooler Josiah Miller. Benjamin Stevenson (Executive Director of the Lakeland Housing Authority ) and Mayor William “Bill” Mutz expressed praise for the design team (WMB-ROI, Boggs Engineering, and Miller Construction), as well as recognizing the veterans, distinguished guests, and partners that made this project come to life. The ceremony was followed by the Ribbon Cutting and Presentation of Keys, as well as refreshments at the community building, and open house walk-through of one of the micro-cottages.